Tile flooring is one of the most durable materials available, but even the hardest tile isn’t invincible. For example, if a hard, heavy object falls onto tile flooring, Portland homeowners will more than likely have a chipped or cracked tile on their hands. That’s why it’s a good idea to keep a few leftover tiles around for making repairs. STEP 1: Cut around the ruined tile. In order to avoid damaging adjacent tiles during the removal process, use a grout saw or rotary tool with a cutting attachment to break through the grout. STEP 2: Break up the damaged tile. Portland, OR do-it-yourselfers should perform this next step carefully. Use a chisel – or cover the tile with a towel – and a hammer to break up the tile for easy removal. Some pieces may need to be pried up with a stiff putty knife. It’s best to wear gloves during this part of the process in case the pieces are sharp. STEP 3: Remove the remaining adhesive. Next, you’ll need to scrape out any tile adhesive that’s still stuck to the subfloor. A chisel or paint scraper will do the job, but be careful not to gouge the subfloor underneath. 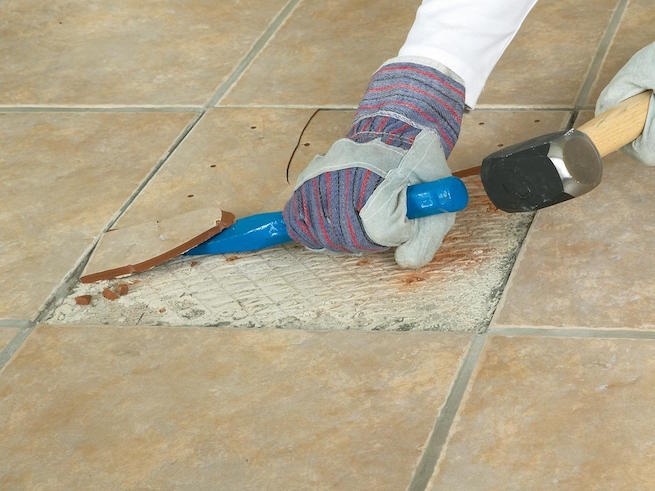 Vacuum up any remaining debris to ensure the replacement tile adheres properly. STEP 4: Insert the replacement tile. Using an adhesive recommended by local tile suppliers, Portland homeowner should then evenly coat the back of the replacement tile and tap it firmly into place with the handle of a hammer. Let the adhesive cure according to the manufacturer’s instructions (usually 24 hours). STEP 5: Apply grout around the edges. Replacing the grout is the final step in repairing tile flooring. Portland do-it-yourselfers can use a sponge or grout float to press grout into the cracks around the replacement tile. Once the grout has started to dry (about 10 minutes), wipe away any excess with a damp sponge or towel. To find out more about tile flooring installation and maintenance, come by our Portland flooring store and chat with our staff.